Today, 29th June is the feast day of Santi Pietro e Paolo, the patron saints of Rome. Therefore, in the city, it’s a Roman holiday and one that the locals take seriously. Everyone gets the day off to roam the city and eat street food, and the celebrations culminate in a huge firework display, the girandola in Piazza del Popolo. Saints Peter and Paul, the apostles are, after the Virgin Mary, the most important saints of the Catholic church. They were both key figures in spreading Christianity immediately following the end of Jesus’ ministry on earth. Catholics believe that Peter was personally appointed by Jesus to lead the church on Earth and he is considered the first Pope. Saint Paul, on the other hand, went on huge missionary journeys all over the Roman Empire, founding local churches, to which he wrote instructional letters. These letters form an important part of the Bible’s New Testament. Tradition has it that both of these men ended up in the city of Rome, where they were executed for their faith, Saint Peter by being crucified upside down, and Saint Paul by beheading. Both were buried at opposite ends of the city. The early Christians venerated their graves and eventually, when Christianity became the official religion of the Roman Empire, churches were built over the graves. Over the years these grew into huge basilicas, San Pietro in the Vatican, and San Paolo fuori le mura (Saint Paul’s Outside the Walls) in the south of the city. Both of these churches were indeed built over ancient graveyards and archeological excavations have found ancient tombs bearing the apostles’ names, directly under the high altars in each. The current Saint Peter’s Basilica is probably the most famous and most visited church in Italy (although technically it is in the Vatican City, an independent state). It is the centre of all of the most important ceremonies of the Roman Catholic Church and where the Pope usually makes his appearances. It was built between 1506 and 1626 with contributions by Michelangelo, Bramante, and Bernini. The dome of Saint Peter’s Basilica. Saint Paul Outside the Walls is in the south of the city of Rome, although technically it too is on Vatican territory. The current building dates to the early nineteenth century, the previous church having been burned down in 1823. The interior is most noted for it portraits of all 266 Popes up to and including Pope Francis. The Basilica of Saint Paul Outside the Walls. Portraits of the current and recent Popes in the Basilica of Saint Paul. 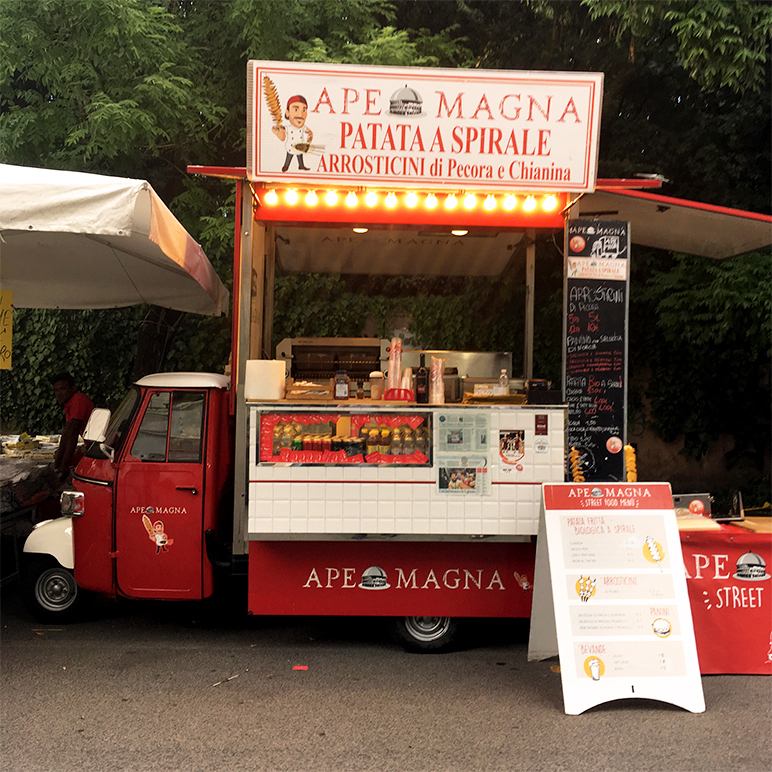 As part of the celebrations for the Feast of Saints Peter and Paul, there is a mercatino, or street fair surrounding the Basilica of Saint Paul. This includes all the usual things found at Italian markets, clothing, DVDs, and mobile phone covers. However, it also has a lot of kitchen ware and, most importantly, street food. One of the stalls this year is selling wooden implements for pasta making, including as you can see in the picture, a chitarra. This is a wooden box, covered with guitar strings, which are used to cut sheets of pasta into tonarelli, a kind of square spaghetti. Tonarelli are considered very traditional in Roman cuisine and are often eaten alla carbonara. Porchetta is the Italian street food per eccellenza. It consists of spit-roasted pork, stuffed with a variety of herbs and spices. It’s served sliced in a roll and is one of the most delicious things imaginable. If you want to try it at home, try my recipe here. Another Italian street food mainstay is fritti, literally ‘fried food’. This covers a multitude of ‘sins’, but it is a public holiday. My eye was attracted by a stall selling olive Ascolane, literally ‘olives from Ascoli Piceno’. This is a town in the region of Le Marche where these little balls of deliciousness were invented. They are now found all over Italy, but especially in the central and southern regions. These consist of green olives which have been preserved in ˆsalamoia (brine). They are then stuffed with a meat paste and then fried in breadcrumbs. The result is a salty snack, with a creamy savoury filling. Perfect for eating as you walk or with a spritz as an aperitif. The earliest references to them are from the early 1800s and are traditionally sold at fairs on high days and holidays. Another fried delicacy from Ascoli Piceno are cremini fritti. These are cubes of pastry cream, crema pasticcera, which have been deep fried in breadcrumbs. Yes, you read that right, deep fried pastry cream. These are extraordinary because although they are sweet, the breadcrumbs are often a little salty, a mix of flavours which you find all over Italy in traditional food. (See for example this recipe from Modena). Have you ever tried any of the food in this post? Have you ever visited the basilicas of Saint Peter and Saint Paul? What’s your favourite Italian street food? I’d love to hear your comments. Venetian word of the day: Òe! Buon Compleanno Maestro: Happy Birthday Michelangelo!